San Marino | Where is Yvette? Because microstates are fun, and I am not referring to the physics kind, Sunday was spent on a trip to San Marino. San Marino is an independent state within Italy which occupies a grand 60 square kilometers with a population of 20,000 souls, so who could ever pass up a country that is the size of a small town? Not bad considering the day before we were in the middle of a snowstorm! One of three forts on the top of San Marino, ie the top of the hill in the first picture. Curiously, San Marino also has a (tiny) standing army even today- the smallest country in the world to do so- who basically parade around in silly uniforms. They also have things on display around the fort like a pair of cannons donated to them from Switzerland should Italy ever invade I guess. It should be noted by the way that there is an Italian embassy in San Marino. In case you can’t drive the five minutes out of the border, I suppose. A cable car that runs from the bottom of the hill to the top- probably the only aerial tramway described in detail on a country’s main page on Wikipedia. Also, apparently if you are elected to public office in San Marino and refuse, you are sent to jail. Something to keep in mind for anyone seeking citizenship I guess! 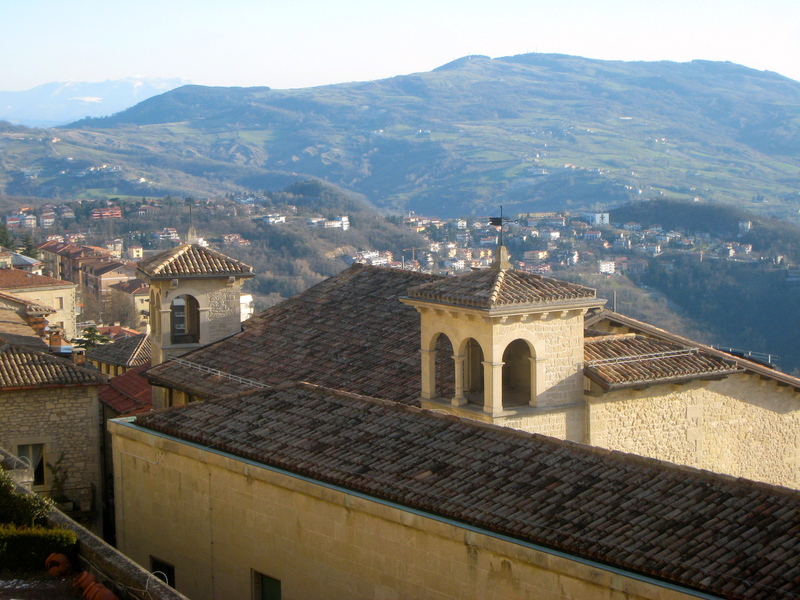 So what is there to do in San Marino anyway? Answer: buy stuff at cheap prices. San Marino has no taxes on products sold in stores, meaning everything is almost as cheap as goods in Asia, meaning it’s filled with tourists on a daytrip across the border who can’t resist a purchase or two. Frankly, it has the feel of a giant duty-free section in an airport. This picture is here because it turns out there are lots and lots of weapons stores in San Marino, conceivably so the gents have something to peruse while the ladies are hung up in the many jewelry shops. The no-tax thing leads to an interesting variant between San Marinoans and Italians, though, in the sense that they are much more bent on earning money as soon as possible- few people go on to university because why bother when you can get such a great steady income from tourism? So few people go for further education that there aren’t even any lawyers in San Marino- they all need to be imported from Italy- which arguably isn’t the most terrible example but leads to the San Marinoans to have a lack of culture compared to their Italian counterparts. So say the Italians anyway. Finally, a picture of Massimo who finally gave up the camera so Aniko could take a picture! This is the obligatory stop in one of the many liquor stores to try one of the few exports of the country- because it’s so cheap, the guys who work at the store have no problem giving you multiple small shots with no obligation to buy. What a nice country! One final photo from the end of the day, admiring the gorgeous sunset. My goodness, I would never tire of admiring the gorgeous scenery in this part of the world.